This review was first posted on Music, Books and TeaI was offered the chance to review We Bury the Landscape by the author, and whilst it's not the normal type of book I would normally read, I was definitely intrigued by its concept. I think that it's always interesting to see where author's gain their inspiration from, so receiving a book of 100 short stories and poems that are all based on different paintings definitely appealed to me.I'm not a great lover of art (in this sense), yet I can appreciate the hard work and passion that goes into a painting, as it is very similar to the hard work and passion that goes into a novel. As I'm not that well-versed in art, I had to look up each painting before reading the accompanying piece. This was time-consuming but well-worth the effort. What I loved about discovering all these new pieces of art was the fact that whilst I may have interpreted a piece to represent one idea, the author interpreted it to mean another, and because of the stories, I was able to understand her interpretations as well. So many of these stories were poignant to me as well. The story that the title is taken from, Abandoned Dwellings, (inspired by Vladimir Kush's painting of the same name), really connected with me, especially as I flicked between painting and prose. Landscape with Grenade was possibly my favourite story, as I loved the idea that had been taken from the art, and I could actually imagine the people in the painting re-enacting the story.I am so pleased that I was given the opportunity to read this book. 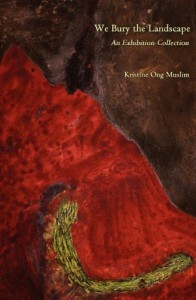 I doubt I would have ever picked it up otherwise, and I would have really been missing out on all these wonderful pieces of artwork, and the fantastic poetry and prose of Kristine Ong Muslim.